Snow Creek is a village of a few dozen old fishing cabins and bohemian homesteads, encircled by wilderness and only ten minutes from Palm Canyon Drive. When I went to interview Mildred Herwood here some years ago, I noticed that her little red house claimed the choicest spot in a choice setting. Mildred was snug against the mighty face of Mt. San Jacinto. 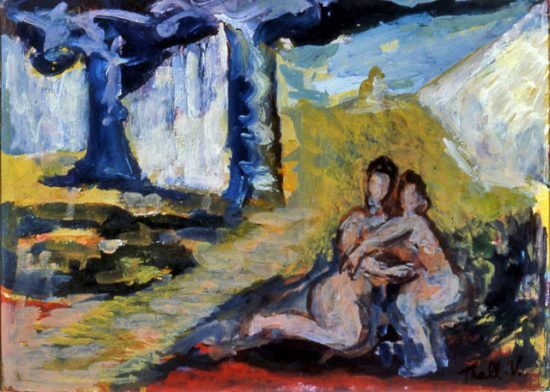 Our conversation took place long before I was writing about desert artists, so I barely took note when Mildred mentioned that she had moved here to live and study with an abstract painter who was friends with Willem and Elaine de Kooning and Arshile Gorky in the heyday of the Abstract Expressionist movement. Mildred pointed out some bound volumes in a bookcase, saying they were the unpublished memoirs of Victor Thall. 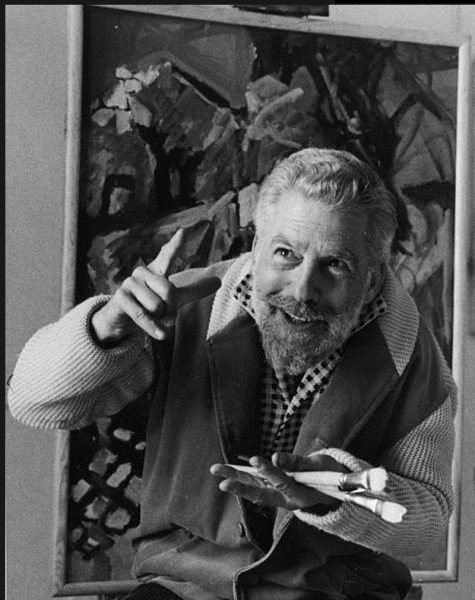 In the years since, I’ve learned more about art and now know a “lost” abstract artist with roots in the New York School is a coveted find. 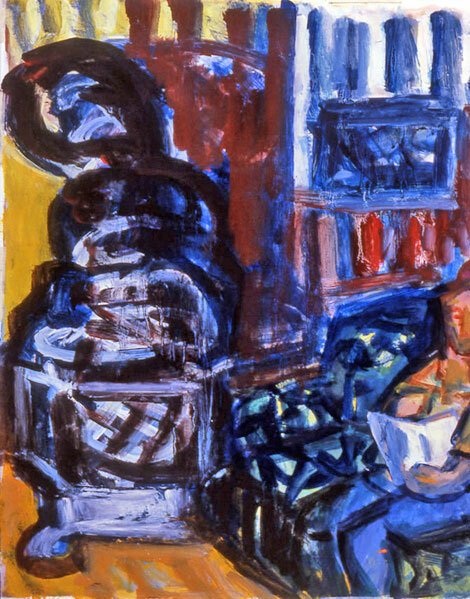 The forgotten contemporaries of de Kooning, Pollock and Gorky pop up now and then in art magazines. Each rediscovery sets people talking, as collectors and curators hope they have a goldmine on hand. Gold or not, I’d say it’s time that we reclaim our very own Palm Springs link to the legendary New York artists. Victor Thall came to Snow Creek as an older man, disillusioned with pretty much everything. Still he retained the paint-splashed macho of a Jackson Pollock or de Kooning. 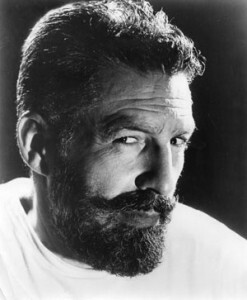 With his upturned mustache and a debauched gleam in his eye, he looked like a villain from an old movie. Another Snow Creek resident, Robert Brooks Barron, studied with Thall and recalls the artist target shooting in his bathrobe. A reptile devotee, Thall had a six-foot toilet-trained iguana, and kept his cash in a snake drawer in the kitchen. Traveling to Paris, he studied at the Ecole des Beaux Arts, the Academie Julien and the Grande Chaumiere. With a friend he took a bicycle trip to the south of France hoping to glimpse the home of Henri Matisse. When Matisse noticed two young men with art supplies strapped to their bikes, he invited them in and compared their rolled-up drawings to a Picasso he took off the wall. 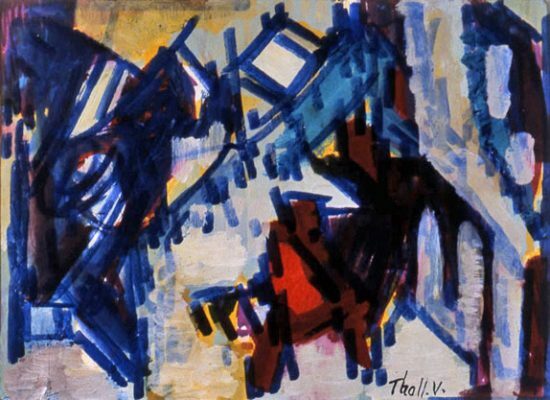 Back in New York in the 1930s, Thall fell in with de Kooning and Gorky. 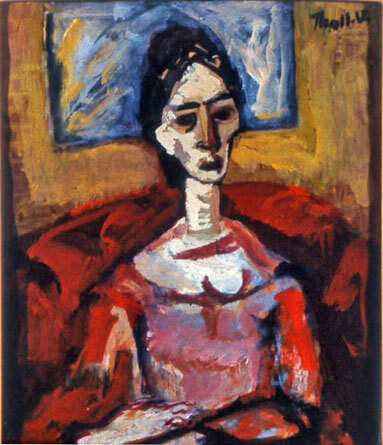 He participated in the WPA New Deal Art Project and later taught at the Art Students League. 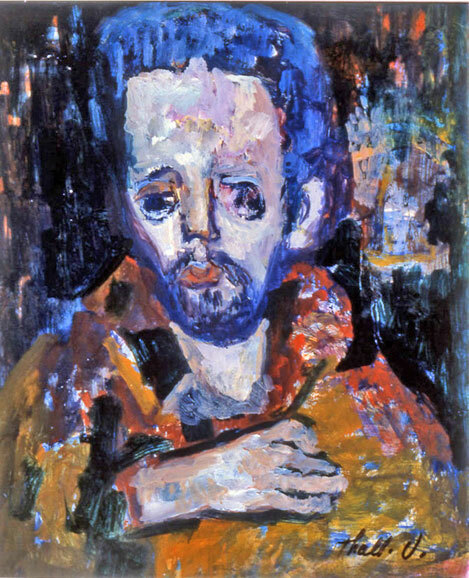 He was in the middle of everything as the Abstract Expressionist movement–also called the New York School–gained prominence, becoming one of the first true American schools of art. Thall had several solo exhibits, including one at the George Binet Gallery in New York City in 1947. 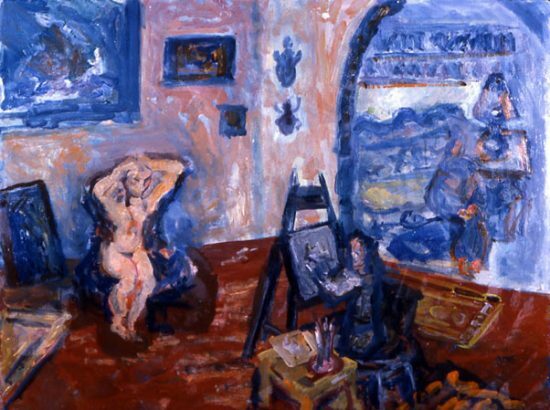 The catalogue said: “Victor Thall paints from a palette so varied in hue and value that on his canvases lay the molten images of his fiery talent.” In 1949, a New Yorker art critic named him one of the two best painters in the Whitney’s Annual of Contemporary American Painting. Yet as fame crept closer, Thall became grouchy and restless. He railed at the artists and dealers who lusted for profit, and condemned the fraud he saw everywhere. As his peers became famous, Thall spent the next decades roaming around Mexico and the Caribbean, exploring indigenous art as a key to abstraction. 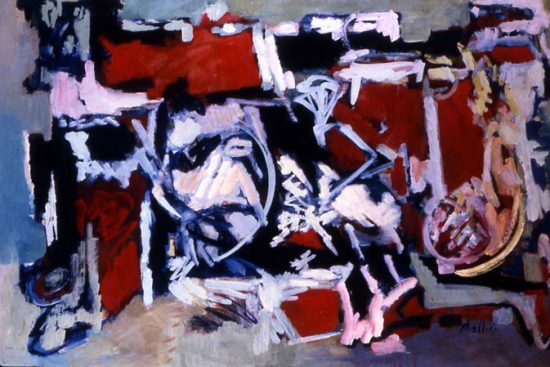 He was “in hot pursuit of the essence of abstraction,” wrote Gary Herwood. Often left behind on this pursuit was his young wife, Mona, and his two daughters. He eventually made his way to Los Angeles, then Palm Springs and found a boarded-up house to move into in the village of Snow Creek in 1969. Why Snow Creek? For all his urban swagger, Thall had always loved the outdoors. 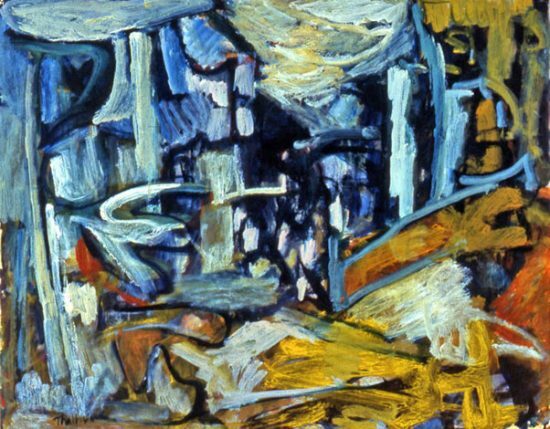 He explored the oceans as a scuba diver; the natural forms he found underwater inspired many of his abstractions. Snow Creek had no coral reefs but it did have voluptuous boulders and a cinematic mountain face that appealed to Thall. “He liked the place, the stream, the quiet and the privacy,” Mildred Herwood later told me. A tiny island of green in a rocky vastness, the village has always been a magnet for artists, eccentrics and hermits. The artist Axel Linus lived here, as did the hermit woodworker Peter Russ. The contralto soprano Madame Ellen Beach Yaw could often be heard wandering through the village singing opera. Mildred Herwood was one of the students who came to Snow Creek to study with Thall. She was an understated, salt-of-the-earth woman–nothing like Thall’s usual art crowd. When I met her 16 years after Thall’s death, Mildred remained wholly devoted to him, despite his womanizing. “Mildred told me the best years of her life were spent with him,” says her former neighbor Les Starks. In his monologues, Thall was relentlessly contrary, as he had been all his life. He refused to go to school as a child, and he quit the Art Students League because the instruction was “a lot of bilge”. As with most contrarians, the trait can be traced to parental friction. Thall’s mother obviously was a source of unhappiness, as he told an interviewer: “I couldn’t care less whether my mother loved me or not”. He added that “nothing could have made me happier” than escaping from her when he was five years old. Thall had spent so many years in exhausting revolt against everyone and everything. It must have been a relief for him–as for many others–to discover the reassuring bulk of Mt. San Jacinto. In Snow Creek he found the great maternal shoulder where he could finally rest.